Norway covers the western and northern sections of the Scandinavian peninsula, and includes the northern territories of Jan Mayen Island and the Svalbard archipelago. In the east, Norway borders with Sweden, Finland and Russia. At the very north is the Barents Sea and in the west the Norwegian Sea. The North Sea and Skagerrak lies off the southern coast. Norway is 1,752 km long from Lindesnes to Nordkapp. The coastline is 21,112 km, and the country is covering 323,802 sq km. The population is around 4.5 million (2002). In the southern hemisphere Bouvet Island, Peter I Island and Queen Maud Land are Norwegian territories. Norway is richly endowed with natural resources, including oil, gas, fish, timber and waterfalls used for hydropower. But only a small percentage of Norway's land area is suitable for productive agriculture or forestry. All over the country you could find wilderness including large forest areas, different pristine landscape and mountainous tracts. The highest mountain, Galdhøpiggen, is 2469 meter over sea level. According to the history, the petty kingdoms in Norway were united into a single realm in approximately 885 AD by a Viking king. After 1319, Norway lost its independence and in 1380 it entered into a union with Denmark. After over 400 years of Danish autocracy, Norway became an independent nation with a loose union with Sweden as a part of the Kiel Peace Agreement. It was on the 17. May 1814 at the national assembly at Eidsvoll that Norway could finally celebrate its constitution which is still in effect today. Sweden allowed Norway to keep its constitution in exchange for accepting the union under a Swedish king. Norway functioned mostly as a free and independent nation until the union was formally dissolved in 1905. Norway is a constitutional monarchy with a parliamentary democratic system of governance. State power is formally distributed between the Storting, the Government and the courts. There is also a geographically distribution of political power into state, county and municipal levels. The public administration, which was designed to serve the needs of the political bodies, is sometimes viewed as a fourth state power, as it now takes independent action and exert influence on the shaping of policies. Norway is divided into 19 counties and 431 municipalities (2007). Initially land in Norway was occupied by individuals for farming. Later the king and the church were owners of large properties. From approximately 1650 the king started to sell out land, a process that lasted for almost 200 years. At the end of the 19th century 80% of properties were in private ownership. The first known property register in Norway dates from about 1250, implemented for raising tax to the crown and for drafting men for military service. But formal registration of private properties started in the medieval times. The current legislation and system came into practice during the last century, mostly based on the German system. However a proper cadastre, based on professional surveying and mapping of boundaries, only existed in the bigger cities before 1980. In rural areas properties were subdivided without a requirement of a field survey and map. The current law, The Land Subdivision Act, came into force in 1980 and demands to determine unclear boundaries, mark and survey the boundary points and produce a boundary map and update the cadastral map. Collecting land tax is not an important source for financing public sector in Norway any more. But the cadastre plays an important role for various institutions of public sector. Municipalities provide necessary information on land and buildings from the cadastre for collecting charges related to water, sewer, renovation etc. The cadastral data are also important for land use planning, physical planning / zoning, constructing activities, environmental protection etc. The need to protect private rights in land is certainly an important issue for registration. The Norwegian Mapping and Cadastre Authority (NMCA) under the Ministry of Environment, was founded in 1773. NMCA is the national supplier and manager of geographic information covering land, coastal and territorial waters. The basic activity is to establish and manage the national geodata infrastructure, “Norway digital”. Important content of Norway digital are the geodetic network, primary data sets and basic standards. NMCA comprises the following units: Land Mapping division, Geodetic institute, Hydrographic service and Cadastre & Land registry. The operation of the cadastre is supervised by the NMCA. All the tasks before the field survey can start and until the property registration, mapping and documentation are accomplished, are the responsibility of the municipalities in Norway. Coordination of government measures relating to the municipalities, legal matters and the interpretation of legislation concerning municipalities and municipality boundaries are done by the Ministry of Local Government and Regional Development, the Regional Development Department. The Land Subdivision Act states that the municipalities have monopoly on registration of parcels, including demarcation and surveying. Surveyors are employed by most all municipalities. Most municipalities have established a separate surveying unit which then acts as the land registration authority. However it is possible for the municipalities to outsource some of the practical work with field survey and production of documents. Less than 3% of cadastral surveys are currently done by private surveyors. GeoForum as an association for Cartography, Geodesy, Hydrography and Photogrammetry was founded in May 1969. This association has approximately 2000 members through 15 local societies. Norway has no licensing system and no private licensed surveyors. The Land Subdivision Act does not demand any license or specific education for the surveyor in charge. Most municipalities have employed engineers with 2 - 3 years of adequate education, but there are major differences. The educational system in Norway for cadastral surveying is spread over two levels. Four Norwegian colleges offer education where cadastral science is part of the study. You can have a degree in Land Consolidation in Bergen, and a bachelor in Geomatics in Gjøvik, Bø and Ålesund. Three Norwegian universities offer education where cadastral science is part of the study. Both the Agricultural university of Norway and the Norwegian Institute of Technology give the possibility for a master degree in Geomatics. Oslo University offers a master degree in equivalent Geographical subjects. The Norwegian Cadastral system has a multipurpose role and is used for a broad variety of tasks by governmental institutions / the public sector and private companies. Today the most important matters are information for the land market and the planning activities and municipal services. The Norwegian Cadastre is fully computerized as a central database under the control of the Norwegian Mapping and Cadastre Authority. The cadastral maps however, are currently held at local level only. There are three main units of the Norwegian cadastral system: Information about Parcels, addresses and buildings. The parcel unit comprises property number, area of surface, land use, owners name / identification and postal address, coordinates for a reference point, reference to cadastral map sheet and cross-reference to buildings and addresses. The address information comprises street name and house number, district codes, reference point and cross-reference. The building information comprises building identification number, type / use, number of floors, numbers and data about each flat (including identifier), reference point and cross-reference. Our computerized cadastre system was implemented in the 1980’s. This so called GAB register is for the registration of Ground parcels, Addresses and Buildings. The data registered by the co-operation between the Norwegian Mapping and Cadastre Authority and the municipalities are technical data. In addition the above mentioned parties are responsible for the parcel maps, a graphical overview over the cadastre, but not yet totally computerized and not linked to the GAB system. The computerized Land Book has until 2004 been maintained by the local courts with reports sent to the state database. The daily monitoring of the functioning of the database is outsourced to a company owned by the Ministry of Justice. The parliament decided in 2002 to transfer the Land Book from the courts to the NMCA. 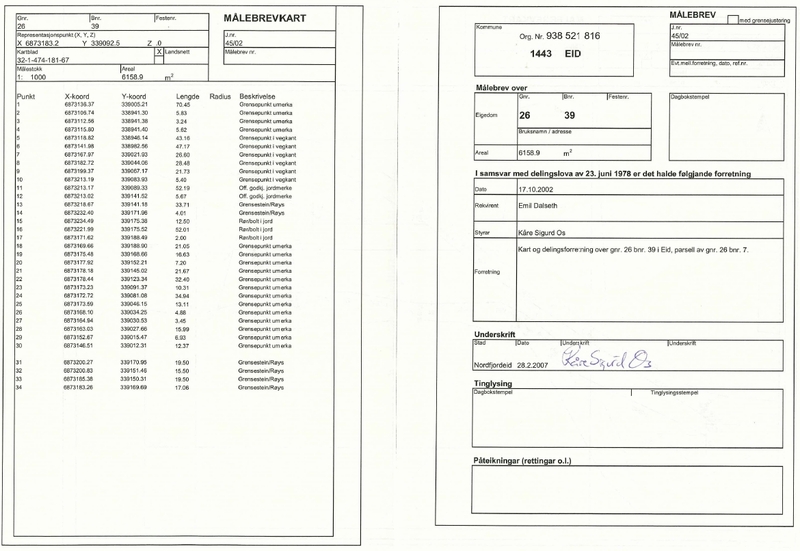 87 court offices will transfer the Land Book to NMCA’s main office, Hønefoss, over approximately 3 years time. This work has started early this year as planned. 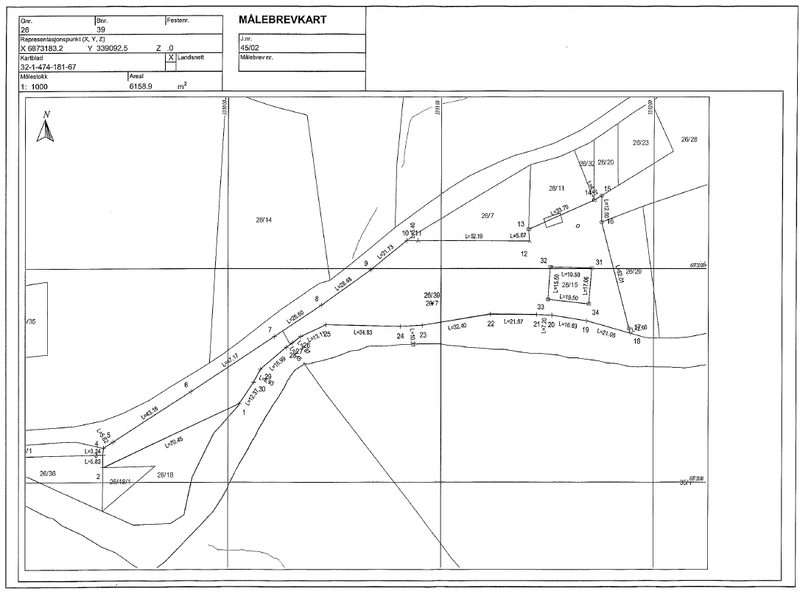 The municipal cadastral maps are in scales from 1:500 to 1:5,000. The cities and towns have been well mapped and usually in scale 1:500 and 1:1,000. The majority of the municipalities apply digital mapping now. The rural areas were however poorly mapped until the 1960’s, except for small scale topographic maps without property boundaries. A large mapping program was then started, including registration and mapping of parcel boundaries. Applying photogrammetry 200,000 sq.km. have been mapped in scale 1:5,000. Surveyors and land owners were involved in the premarking of the boundary points for later air photo interpretation. The maps, named “The Economic Map of Norway” were produced by private Norwegian companies. The aim of this massif mapping was the needs for agriculture and forest management, land use planning as well as for land and property management. The Norwegian Mapping and Cadastre Authority, in close cooperation with the municipalities and other major interested parties, will soon finish the digitalization of the cadastral part of this map. Integrated with the digital data from the municipal large scale cadastral maps, the possibility for a Cadastre which includes the property maps will soon be a reality. Since the cadastral map only is available on a local level it is mostly used for local administration and planning and as documentation for the land owner. Many of the municipalities have their own web-pages where the cadastral map is a natural part. 1) Cadastral surveying is very much focused on the geodetic part, whilst legal issues are generally not dealt with in the survey. When the municipalities were assigned the responsibility to undertake parcel surveys, only limited qualifications could be demanded. Cadastral surveys in Norway are in most cases done by personnel with specialized education for only 1 or 2 years. Legal issues are often lacking in this education. 2) The initial establishment of the cadastre was mainly based on data from the former Land Book in analogue form, and from various sources in the municipalities. The cadastre has been gradually improved over time, but data quality and data completion needs to be even better. In particular more detailed information about buildings is required. 1) A national parcel map database is under implementation by the NMCA in co-operation with the municipalities. A new Norwegian cadastre system will be implemented during 2007 and 2008, based on today's information from the GAB system and the national parcel database.